The Faroe Islands managed to hold Sweden from scoring opportunities during the most of the first half where Zlatan Ibrahimovic, however, proved his class with spectacular long range efforts out of nothing. On 19 minutes he let fly from 25 metres, but Gunnar Nielsen in the Faroese goal punched away to safety. Eighth minutes later Ibrahimovic had a replica effort saved, and where the Faroes were relieved to see the rebound go wide. Ibrahimovic went close again on 29 minutes where his deflected drive went close by the upright. 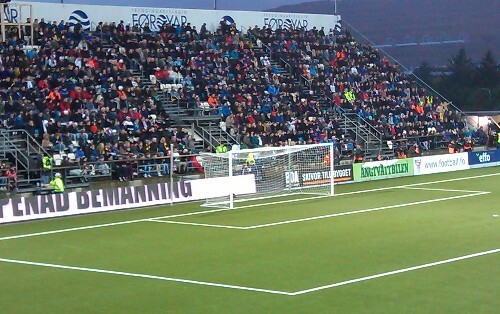 Three minutes later Símun Samuelsen went close for the Faroe Islands, but the shot went narrowly wide of Andreas Isaksson's goal. This was the goalkeeper’s 100th cap for Sweden. The last 15 minutes of the first half were quite even, but Ibrahimovic was again the danger-man for sweden when he turned on the edge of the penalty area, but again Nielsen as up to the task. Sweden upped the tempo in the second half and threatened early on and Nielsen made a fabulous save to deny Kim Kallstrøm’s shot from 20 meters following a corner on 53 minutes. However, it were the Faroe Islands who took the lead after 56 minutes when Jónas Tór Næs’s long throw-in was only half-cleared by Sweden's Jonas Olson's header which fell to central defender Rógvi Baldvinsson who fired home from close range. The minute after, Ibrahimovic was close for Sweden with another long range effort that went half a meter over the bar. Sweden found the equalizer on 64 minutes when Ibrahimovic with a brilliant pass found Alexander Kacaniklic (who had just come on) on the left hand side of the penalty area from where he curled the ball into the far side of the goal out of reach of Nielsen. But the circumstances were desperately unlucky in connection with the goal as right back Tór Næs was getting treatment on the sideline when the goal came. And it was exactly at Tór Næs's position that Kacaniklic scored from. Sweden dug out the winner on 74 minutes when a delightful chip over the Faroese defence played Ibrahimovic clear to scoop the ball over the line. Photo above shows the empty Faroese goal. This was when right back Jónas Tór Næs was lying injured outside the penalty area and was subsequently treated on the sideline while Sweden scored the equalizer.